Giltbrook Workwear are a specialist work wear laundry. Their advanced equipment uses specially developed technology to enable them to conserve both energy and water. 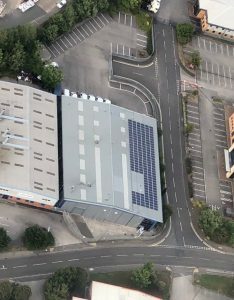 Having previously worked with the University on an environmental project to assess the feasibility of introducing LED lighting system, Chris Jackson, CEO, asked for help through Energy for Business, to assess and recommend other energy saving measures and renewable energy technologies that could be implemented. The company operates from a modern, purpose-built unit in Ilkeston, Derbyshire. As a forward-thinking and innovative company with environmental sustainability high on their mission statement, they are always looking for new ideas to increase efficiency and minimise their environmental impact. The company uses hi-efficiency boilers and have installed a rainwater harvesting system and energy efficient LED lighting – measures that have seen a large reduction in their energy bill. They approached us to see what other measures they might undertake to improve their performance even further. We conducted a detailed solar feasibility assessment. 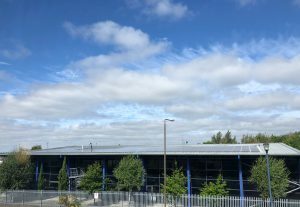 The information provided helped to justify proceeding with the installation of a 50 kWp array of 180 roof-mounted solar photovoltaic panels. In addition a postgraduate student was placed with the company to assess the feasibility of waste water heat recovery, solar photovoltaics and solar thermal systems, energy-efficient lighting and alternative fuel options for their vehicles. . The support provided enabled Giltbrook to adopt new technologies with the potential to improve energy efficiency and sustainability and to reduce greenhouse gas emissions. They are now able to produce their own energy and have added to already excellent credentials as an innovative low-carbon business. The changes implemented will result in significant cost savings as well as a greenhouse electricity reduction of over 23 tonnes per annum. Solar photovoltaics is the technical name for what are commonly referred to as solar panels, solar cells or solar PV. These cells convert light energy (photons) into electrical energy (voltage and current), which is called the photovoltaic effect. Discovered in 1884, the effect was first used for energy generation by Bell Laboratories in 1954 and given a development boost, as with many technological discoveries, in the space industry for satellite power systems. Solar cells then became commonly used to power smaller items such as calculators and, with more recent price drops, for large-scale energy production. Currently 1.9% of worldwide electricity is produced by solar PV with an average of 43,000 solar panels being installed every hour within 2017! The vast majority of commercial solar PV cells are made from silicon, although research is taking place into a variety of new materials and techniques to harvest energy from sunlight. Take a look at some of the research currently underway at the University of Nottingham into the next generation of renewable energy.